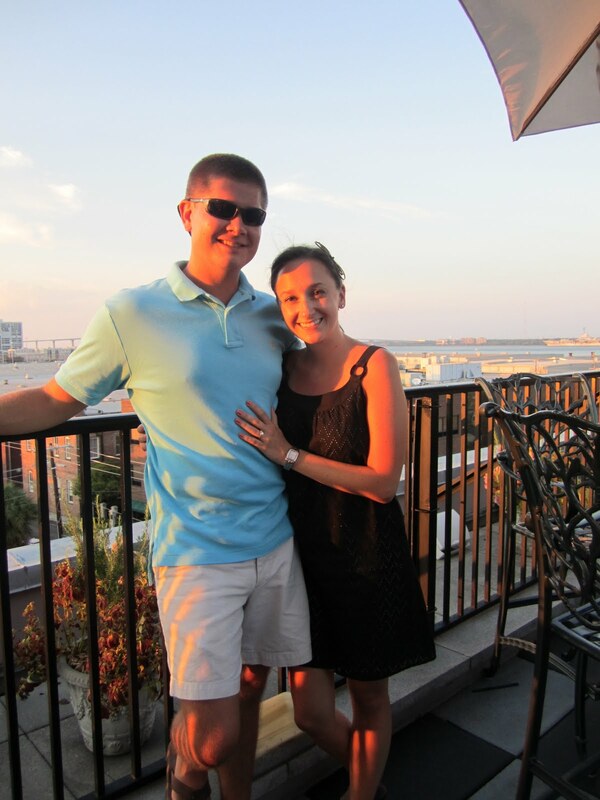 LAURA COX : Folly Beach Vacation + An Exciting Announcement! 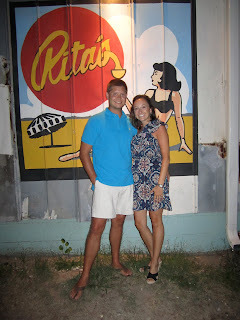 Folly Beach Vacation + An Exciting Announcement! Last week our family took our annual summer vacation. For the past several years we've gone out of the country, but since our family is expanding, we decided to stay more local this year. 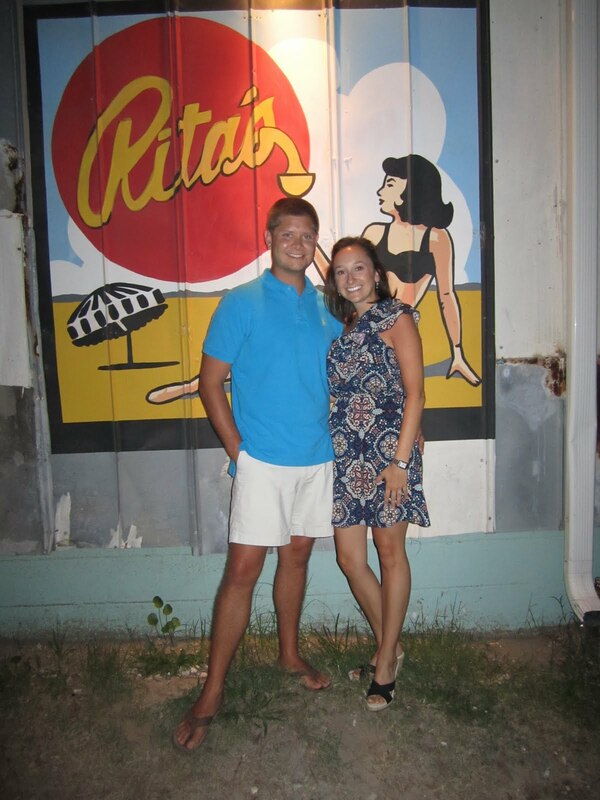 We decided on Folly Beach because of its proximity to Charleston and Columbia, and my sister April and her husband Ian love the area. Folly Beach is such a relaxing vacation spot. Its completely non-commercialized and has such a quaint downtown area. You really feel like you're going back in time when you vacation there. All of the downtown bars and restaurants have great food and awesome atmospheres. Our house was located right on the marsh which gave us an amazing view from our back porch. We spent several nights out there with margaritas just enjoying the sunsets. 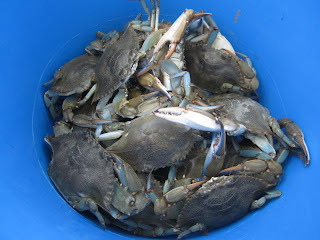 Our house came with crabbing equipment that we put to use one night. We caught about 25 blue crabs which ended up yielding just enough meat for a tasty crab dip that we threw together. We got some great beach time in, too. Last week started Folly's off season, so we were one of the only groups on the beach. The weather was great too, never got above 90 degrees. One night we took advantage of being so close to Charleston, and went into their downtown area. 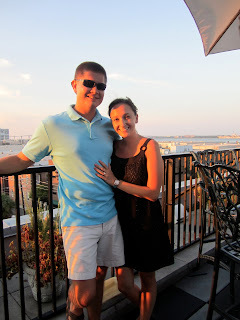 We started the evening with drinks at Market Pavilion's rooftop bar. I had never been here before, but it's one of my new favorite spots. The drinks are a little pricey, but the spectacular view made it so worth it. From there we took rickshaws to Rue De Jean for dinner. 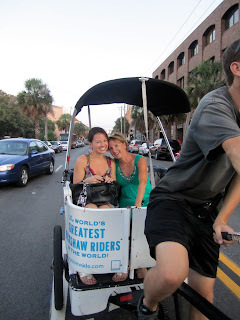 The rickshaws were such a perfect tourist experience, taking us through the beautiful residential areas of downtown Charleston. Dinner at Rue De Jean was amazing as usual. After dinner we took our stuffed bellies back to Folly Beach and got a good night's rest for another exhausting day of relaxing on the beach. And now for the announcement... Mr. T and I are getting married! The first day we got there, Mr. T popped the question out on our back porch overlooking the marsh. It was perfect; simple and just the two of us. The rest of my family arrived shortly afterward, and we got to celebrate our engagement for the rest of the week! And if you're curious, here's the ring! Isn't it beautiful? I primarily wear yellow gold, but also wanted today's traditional white gold ring. The combination of white gold/white diamonds and yellow gold/yellow diamonds was a perfect solution. We had such an amazing time at Folly Beach. It truly was one of the best and most memorable weeks of my life. I am so excited for the next year of planning a wedding. I'll be updating you with plans and all of the DIY projects I've got going on for it. what a beautiful ring!! congrats! What a beautiful ring!!! Congrats! Sounds like y'all came up with some of the best possible places to go to while in Charleston & out at Folly. I LOVE the rooftop @ Market Pavilion.